The Cathedral of St. Lawrence in Trogir (Katedrala Sv. Lovre) is a part of the historic core of Trogir, which is included on UNESCO World Heritage list. The cathedral, called St. John among local citizens, is the most distinctive building, dominating the area. Built on foundations of the old basilica which was destroyed after Saracens attack 1123, construction of this splendid structure started in 1193 and has been building for four centuries until finally completed around 1500. Since its construction lasted several centuries, it illustrates all the styles that succeeded one another in Dalmatia. It is a Roman Catholic triple-naved basilica constructed in Romanesque-Gothic style with three half circle aphides and vestibule above which bell-tower is erected . Most of the work in the construction of the cathedral took place in the 13th century, being mostly completed in 1251. That means the building is mainly in Romanesque style, whilst the vault inside is gothic as it was built during the 15th century. 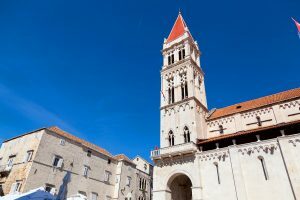 The bell-tower of Cathedral of St. Lawrence is the tallest in Trogir area. It is 47m high tower built in 3 different styles during almost four centuries. Work on the bell tower began at the end of the 14th century, but it was not completed until the end of the 16th century. The first floor is in Gothic style and it was built by Masters Stjepan and Matej. After it had been demolished by the Venetians in 1420, it was restored by Matija Gojković. The second floor is in low Gothic style and was probably the work of Venetian masters, as it is reminiscent of the windows of the famous Venetian Palazzo Ca d’Oro. The final floor was built by Trifun Bokanić (1575–1609). On top of the bell tower there are four statues, the work of Venetian sculptor Alessandro Vittoria (1525–1608). In the center of the facade, within a small round opening, there is the carved coat of arms of the most powerful King, Ludvic of Angevin dynasty. 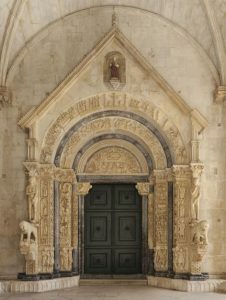 One of the most notable features of the Cathedral is its amazing Romanesque door, carved in 1240 by Master Radovan. It is monumental and unique piece of art of Dalmatian Middle-age plastic, one of the most important monuments of Croatian history. 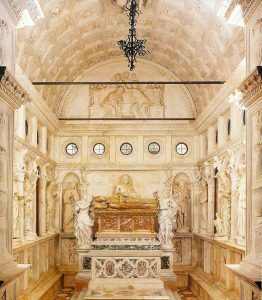 Also not to be missed is the Renaissance Chapel of St. Ivan featuring many fine paintings of St. Jerome and St. John the Baptist, as well as decorations created between 1461 and 1497 by Firentinac and Duknovic.